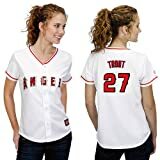 Mike Trout (born August 7, 1991) is an American professional baseball center fielder for the Los Angeles Angels of Major League Baseball (MLB). 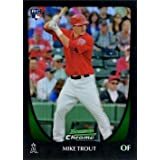 Trout is a seven-time MLB All-Star, received the American League (AL) Most Valuable Player (MVP) award in 2014 and 2016 (finishing second in the 2012, 2013, 2015, and 2018 votes), and is a six-time winner of the Silver Slugger Award. He throws and bats right-handed, stands 6 feet 2 inches (1.88 m) tall, and weighs 235 pounds (107 kg). Trout is nicknamed "The Millville Meteor." 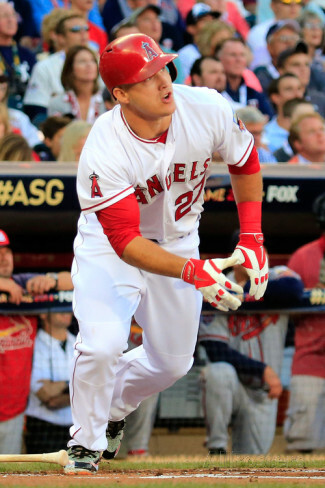 Drafted 25th overall by the Angels in the 2009 draft, Trout progressed rapidly through the minor league system and was called up to the big club on July 8, 2011 to replace an injured Peter Bourjos in center field. He had minimal success and began 2012 in triple A ball where he set the league on fire. Looking for some offensive help, they recalled him up at the end of April and he's been hitting ever since. I wonder how the first 24 picks of the 2009 draft are making out.¹ For Trout's career stats, click here. Featured here are Mike Trout posters, photos, giant collectibles and apparel.